← Can Online Marketing Help Your Golf Instructor Business? aaaa Once your company has made the wise decision to implement an online scheduling program, the next step is to find a program that is right for your organization. There are several features you need to look for in your scheduling software as well as services the scheduling software company needs to offer to make the investment worth your while. Once you put your scheduling software in place, it will become the core of your entire business. That is not the kind of thing that you want to leave to chance. If something were to go wrong with your scheduling software, you need to know that you can get the right support when you need it. Your scheduling software company needs to have email, phone and chat support that you can access at all times. You need to know that if something goes wrong with your scheduling software, you have a way of alerting someone that can solve the problem. When you utilize third-party services on your website, you want your customers to still have a seamless experience. That is why your scheduling software provider needs to allow you the ability to customize the scheduling program. When your customers click the link to make an appointment with your organization, it needs to look like your clients never left your website. When you take on a scheduling service, you want the program to be hosted by the scheduling software company. If something goes wrong, the program is in a central place where the administrators can get at it. A reputable and reliable scheduling program provider will host the service on its own servers and make it accessible to your clients through your website. This reduces the amount of maintenance you have to do on your site, and it also prevents your scheduling software from taking up unnecessary space on your hosting server. When you get ready to configure your scheduling service, you need to know that it is going to have all of the options you need to get the job done. You will need the ability to schedule appointments during your company business hours and the option of allowing customers to choose the purpose of their appointments as well. The more options your scheduling software company gives you, the more that you can do for your customers. Flexibility is always the key to offering excellent customer service. 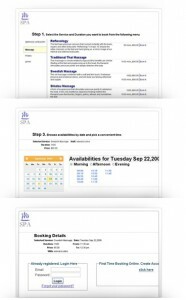 Visit http://www.timepicks.com for everything you need to know about online scheduling software. This entry was posted in Online Appointment Software. Bookmark the permalink.